Using the Marketing module, you can monitor your email queue by going to Send Emails on the Marketing menu and then Monitor Email Queue. 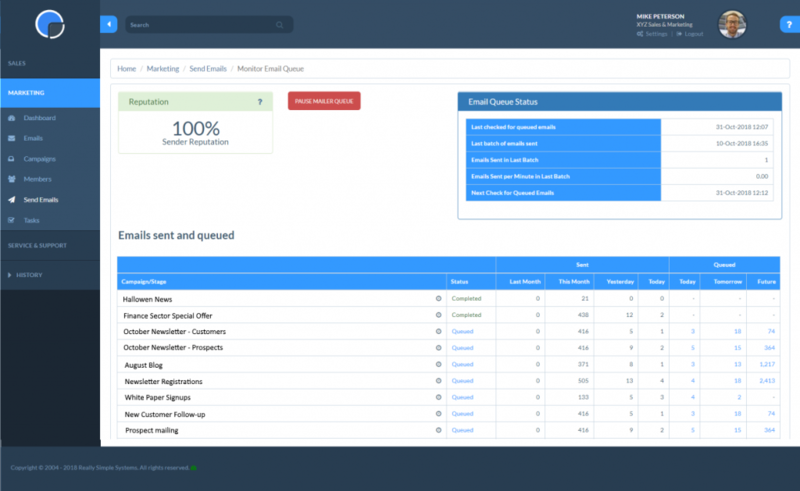 The Email Monitor lets you check how your emails are progressing and shows what has been mailed and what is scheduled. Holding your mouse of the blue figures will display when yoyr emails are due to be sent. Clicking on the Campaign/Stage name will open that Campaign and Campaign Stage, giving further campaign statistics. You can pause the Mailer Queue page by clicking the red ‘Pause Mailer Queue’ button. If you pause the Mailer then no further emails will be sent until you start the Mailer again.